I've spent my life in Oklahoma City but travel often producing short films like London and Peru (below). I'm usually on one side of the camera or the other, listening to people tell their stories and producing client pieces or interviews. I've won three Heartland Emmy awards as video host/director of The Oklahoman's studios, and am FAA Part 107 certified for drone footage. You can find me behind the keys at the Red Piano Lounge at the Skirvin Hilton every Wednesday. On set in The Oklahoman's video studio Interviewing cast members of Disney's national touring production of "When You Wish." Below are three short films and documentaries. "The Odyssey Project" gave a voice to some of Oklahoma City's homeless population. "Sunday Train to Salzburg" is more of a mood setter while "Trinity's Story" looks at life through someone who is visually impaired. More videos can be found in the above navigation. Spent a day on the streets among Oklahoma City's homeless, documenting local artist Jabee Williams as he navigated the system without ID or money. Train ride from Munich to Salzburg on a sleepy Sunday in February of 2015. Never been colder in my life. Salzburg is stunningly postcard beautiful. I've worked with NewView Oklahoma for the past couple of years. They help people with vision impairments. We took this concept to production to feature Trinity's story. As video host and Director of Video for The Oklahoman, I've designed video and audio studios at two locations. Our current studio is located at the corner of Robinson and Sheridan in downtown Oklahoma City. 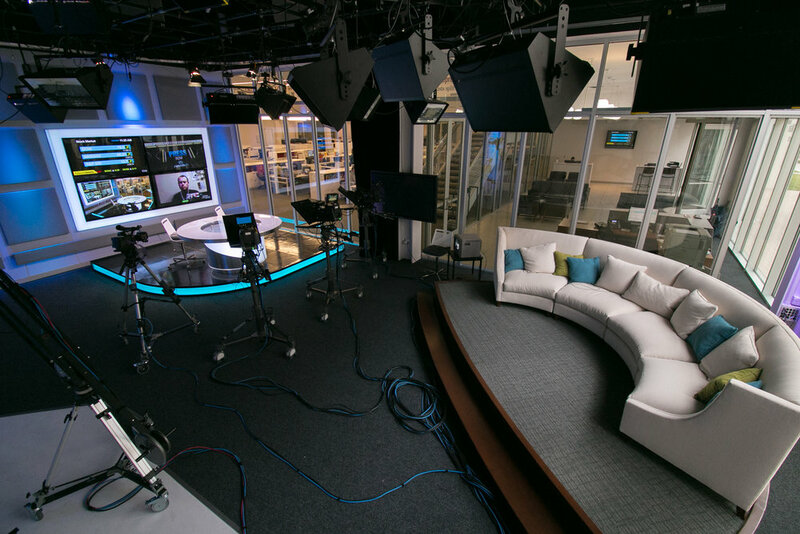 The Oklahoman's studios in downtown Oklahoma City feature multiple sets for interviews and production work. The studio faces into the newsroom and to the street. Collaborating with my colleagues at The Oklahoman, my design is based on sets used by the BBC and France 24, along with some ideas borrowed from NBC (street side) and Fox News (couch). The proximity to downtown gives me access to interview movers and shakers of the community, from politicians to civic leaders, along with celebrities and guests who come through Oklahoma City. We built a 40x22' video screen on the outside of The Oklahoman. Studio interviews and other video productions are shown around the clock, including live broadcasts.